The afternoon session of the NCAA Tournament this Saturday has a wide variety of wagering options and games that could turn into real head-scratchers. Lower seeds Murray State, Ohio U., Washington and Old Dominion could make a mess of the most people brackets, if they could pull off yet another upset. Here is a preview of what the afternoon might look like for sports bettors. The Racers proved oddsmakers correct in assigning them a low number as underdog against Vanderbilt with their thrilling one point buzz-beater against the Commodores. Few teams in college basketball are more balanced than Murray State (31-4, 16-13-1 ATS), with six players capable of scoring in double figures every game, making defenses having to guard everyone evenly. The Racers have run out to 22-1 SU streak and are adept this season to varying paces with 16-4 ATS mark in away games after two or more Under’s. 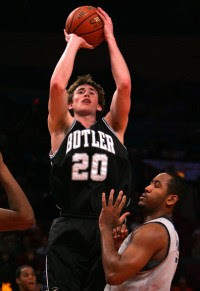 Butler (29-4, 14-19 ATS) passed their first test with bulldog determination, routing UTEP with huge 50-26 second half. The Bulldogs employed a great strategy against the Miners as explained by their head coach. “One of the things we try to do is we try to talk about not hitting home runs, it’s single, single, single, single, one possession at a time, and we felt like if we played that way today we would be able to do some things,” Stevens said of staying patient. Butler is 6-1 ATS the last seven times they have been a favorite of eight points or less. Tennessee’s defense had problems with how San Diego State executed their offense in the paint area, in Saturday’s second round matinee, they will have to defend 25 or more feet to move on to Sweet 16. Ohio U. (22-14, 19-12 ATS) was the first 14th-seed to engineer an upset in four years, shooting 58.2 percent against Georgetown and draining 13-three balls. The dangerous duo of Armon Bassett and D.J. Cooper accounted for 55 points, making the Bobcats a tough out and they are 10-2 ATS after scoring 80 points or more this season. Tennessee (26-8, 13-17-1 ATS) is an 8.5-point favorite and will have to use their size to move Ohio U. around and force feed the ball down low to Wayne Chism. After struggling mightily, J.P. Prince and Scotty Hopson are showing signs of finding their offense, which would be important since they are 1-8 ATS away from Knoxville after playing a game where both teams score 65 points or less. Ohio U. is 6-0 ATS in March and 12-1 ATS in last 13 tries and 14th-seeds taking on six-seeds lose by 5.1 PPG on average. Kansas doesn’t play in many games with a total of 126.5. That is the second lowest number that has popped up on their plate the last three seasons. The Jayhawks (33-2, 14-17-1 ATS) has the skill level to alter their pace, as they are 12-6-3 ATS when the total is 136 or less the past three years. Kansas has the size and quickness edge to contain Northern Iowa (29-4, 22-10 ATS) in the paint and they are 9-1 ATS in the second round of the NCAA tournament. The Panthers desperately have to control tempo, or they will get blown out. Northern Iowa has veteran experience and isn’t going to find the moment too big facing the nation’s No. 1 team. Against UNLV, after having issues with the Rebels press, the Panthers settled in and played their game. UNI is an 11.5-point underdog and is 11-4 ATS after four or more consecutive wins this season. They will need eight or more three-point plays to hang with Kansas and stay out of foul trouble in the frontcourt. Nine seeds that average less than 73 points and have scoring margin differential of less than seven points, are 0-46 SU facing a top seed. Nobody is going to mistake Waco, TX as a basketball mecca, nevertheless Baylor (25-7, 16-9 ATS) is creating a stir with this talented bunch. The Bears wrestled with a hearty Sam Houston State bunch, winning by nine as 10.5-point chalk, but when it is your first NCAA victory in six decades, you don’t quibble about details. Baylor was led by Ekpe Udoh (20 points, 13 rebounds), who recorded his 15th double-double and they are 10-2 ATS having won four of their last five games this season. Old Dominion (27-8, 13-17-1 ATS) followed the old tale of – Cut off the head and the body will die. The Monarchs prevented Notre Dame’s Luke Hanargody from scoring until the final minute and upset the Fighting Irish. Old Dominion played outstanding perimeter defense as the normally reliable Irish shooters were 6-26 from behind the three-point line and they helped expertly when the higher seed tried to dribble and drive. “I guess I’m kind of old school. I think we can guard people and stop them,” coach Blaine Taylor said. The Monarchs have six straight wins (4-2 ATS) and are 4.5-point underdogs. ODU however is 0-6 ATS after six or more consecutive triumphs and 3 vs. 11 matchups have the higher seed winning by 8.8 PPG and if that team was not in the tournament the prior year, they are 12-0 SU. The final contest of the afternoon session should be frantic affair. Both teams score in the mid to upper 70’s and stingy defense is the not the strength of either club. Washington (25-9, 15-18 ATS) moved ahead thanks to Quincy Pondexter’s efforts, making two clutch baskets in the final 34 seconds, including the game winner with 1.7 seconds left. The Huskies are now 13-2 and 10-4 ATS since lost weekend in L.A. in Pac-10 action. New Mexico (30-4, 18-14-1 ATS) looked nervous in opening contest against Montana and played well only is spurts, winning 52-47 as nine-point favorites. The Lobos don’t have a starter taller than 6’8, yet they have a number of players that can fill the basket, including Mountain West Conference Player of the Year, forward Darington Hobson. The Lobos are 14-5 ATS after a combined score of 125 points or less and the number three seed is a 1.5-point underdog to Pac-10 post season champions. Previous articleNova on the ropes?